When I was deciding which gym we should join, I looked at the Salt Lake County Recreation Centers. The fees at our closest facility were $5.00 for a daily pass. As I look at the website right now, it seems that their rates are the same even though it has been three years. This is the origin of my idea that a workout costs five bucks. I would have to workout with a $700 treadmill 140 times for it to “pay for itself.” That would be three workouts a week for a year for it to pay for itself. Of course, if Mike can workout with it also, then it “pays for itself” faster. I’ve used this judge of workout equipment for the last three years and it has made me feel so much better about my purchases. That stability ball that felt like such a rip-off at $20 has paid for itself at least four times. Yourself! Fitness was $40 when we bought it over a year ago, but Mike and I have exercised with Maya so many times that I couldn’t count. It was worth the cost. It even makes me feel better about the workout videos that I HAVEN’T used. That DVD that I bought at Fry’s in Las Vegas because I thought it would be great for working out in the hotel room feels like a waste. It cost twenty bucks and I only exercised with it once. It was a $15 mistake. When I phrase it that way, I feel much better. 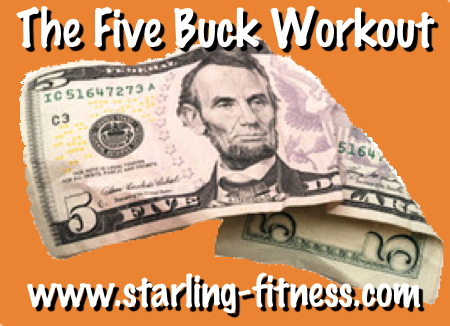 Next time you’re looking at exercise equipment, try the Five Buck Workout evaluation. If you are positive that you are going to run on that treadmill three times a week for a year, then it’s worth it. If you have some doubts about your ability to be that consistent, then you can pass it by without another thought. I like that 5 buck philosophy. I try to get use of all my equipment even if itâ€™s a gift like my mom giving me her old cross country step trainer. I feel some of my equipment I havenâ€™t been using as much as I should and I need to change that. I tried Maya, but she just didn’t do it for me. I prefer to be outside or with people (even fake real people in a video). But at least now I know it was just me and others do enjoy the workout! Thanks for the inspiring messages and thoughtful links everyday. I was just surfing aroun the net and came across http://www.push.tv/ I don’t know much about it but it looks like an interesting take on the $5 workout. You’d need to do each dvd twice for it to equal out but you get a new one each month. Unfortunately it doesn’t look like they ship outside the US. I’d be interested to hear if anyone had tried it none the less. I would have to workout with a $700 treadmill 140 times for it to â€œpay for itself. I just stumbled across your website today. And oddly enough, I paid $700 yesterday for a used Treadclimber. I’m $695 away from having the thing “paid off”. I’ll let you know when I get there. i paid $400 for my treadmill, $70 for my shoes, and $30 for my nike+ sensor. (ipod was a gift…doesn’t count). so that’s $500. but in only 6 weeks, the treadmill has been used 34 times (33 by me, and once by my husband) so we have earned back $170. only $330 to go! Really great way to look at things. Puts sme of those fitness related purchases into perspective. That skipping rope I purchased earlier this year was a steal! I really like your down to earth approach here at starling-fitness. I just discovered you today and this post seems to make a lot of sense to me too. A great way to legitimately justify those workout expences. Thanks for the site and the encouragement. I have to agree $5 isn’t a lot of money.